Do you like beginnings? Some people love them. New relationships, starting a new book, picking up a new hobby, moving to a new place - it may be overwhelming at times, but it's all so exciting. The adrenaline is flowing, all your senses are alert, you feel more alive than ever! You experience lots of little victories - and failures, too - which makes your days seem fuller and more thrilling than before. 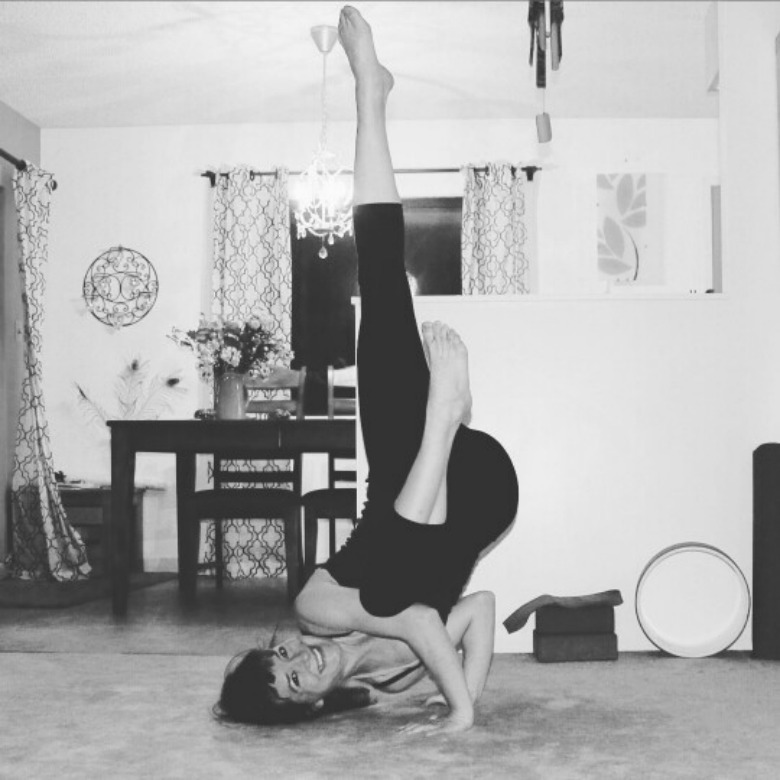 I started on my yoga journey last year, and it was exciting and thrilling for months. Lots of little victories, lots of firsts. Now I'm 10 months in, and I have noticed that the firsts have slowed down rapidly. The shininess of a fresh start has dulled, and the thrill of learning something new has been replaced by boring old routine. I'm not at the beginning any more: I'm somewhere in the middle. The middle of anything is never that exciting. If you are a middle child, you know too well what I'm talking about: You're not the proud first-born and not the precious baby - you're the one that's in-between, with no special adjective attached to it. That's how my practice has felt lately. I'm past the happy glow of first infatuation, yet still so far away from where I want to be - classic "stuck in the middle"-syndrome. I catch myself being impatient and frustrated more often than I like to admit, but I'm admitting it anyway. Saying it out loud actually takes the magnitude away - I do know that it's silly. But sometimes, I can't help it. Last night I played the comparison game, which is a game where nobody ever wins. Sure enough, I ended up a loser. I looked at all the advanced yogis on Instagram, and the yogis I have followed from the beginning, and was sure they are all doing so much better than me. They are all more focused, more determined, practice more, practice harder, and are getting so much better. The irony is that yoga is not about that at all. It's not about the poses, or who is bendier or stronger, but about anybody's own journey. It's about peace, enlightenment, and connecting with your true self. Keep on keeping on. Breathe, practice, learn patience. Because the real lesson in this has always been about patience, and learning to accept the things I cannot change. Instead of grieving the loss of the thrilling beginning, I should be celebrating having advanced a tiny bit on the road I am on. I still can't see my destination, but you know what? That's how it should be. Yoga is about the journey, not the end goal, and so is life. Which is what makes this practice such a brilliant teacher. In a few years I will reach middle age. Or maybe I already have? Nobody knows how much time we have left. It's high time I learn how to make the best of these middle years, and to enjoy them for the good they have to offer: More piece of mind than I ever had before, feeling comfortable in my body, not caring so much any more what other people think of me. Maybe that's the best thing about the middle: Being close enough to the beginning to remember what it felt like, the good and the bad. While there was excitement and adrenaline rushes, there were also a lot of angst, insecurity, and lessons to be learnt the hard way. That has gotten easier now. I'm determined to learn to celebrate the stage I'm entering now: The long haul. I have experience with it in my marriage, and it has brought me so much joy: The trust and deep friendship we have outweigh the butterflies from the first few months by a million. If yoga (and life) are going to be anywhere close to this feeling, than the middle may actually be the best thing that can happen to us?